Exactly one year ago today, I published the first post on my blog with a brief introduction about me and my plans for the site. For those that are new to The Id DM, the following post serves as a brief historical overview of the site and highlights columns you might have missed during the year. Looking back from that first day of the blog and processing all that has happened since then is a strange thing. By all possible measures, the blog has been a success beyond my wildest expectations. I have many people to thank, and will certainly do that below. The Id DM is a creative outlet for me. I don’t receive any income from the site and I have at times found running the site to be more stressful than anything else going on in my life. I can only guess on the total number of hours, days and weeks during the past year devoted to planning, writing, editing and posting articles. 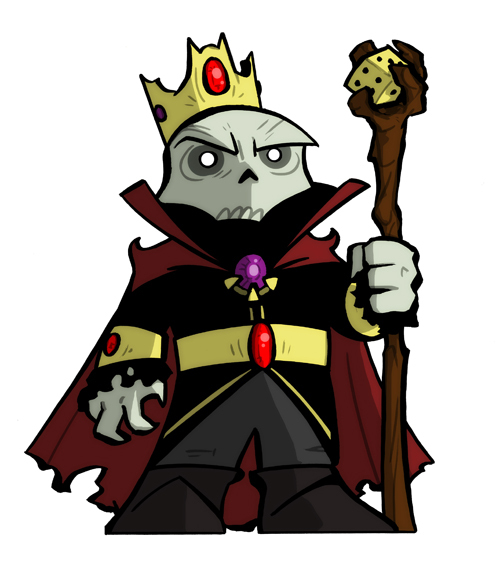 Iddy the Lich. Born March 10, 2011. I enjoy writing and have considered starting a website in the past, but never found a concept that truly motivated me to execute the plan. Before inspiration struck me to write about my roleplaying game experiences, I had consumed a great deal of information about running combat in 4th Edition and the propensity for the game to slow down and grind to a halt. Many opinions were offered to solve the problem, but there was no data to be found to support arguments one way or the other. I found myself with something unique to add to the discussion. I knew I could analyze encounters and present data on statistics such as turn length by player and length of combat by round. I spent the better portion of a week coding episodes of the Penny Arcade podcast series and organizing the results. I posted the results on my blog and hoped that a few people would read about it. I did allow myself pie-in-the-sky hopes that the guys who actually played in the game would read the column and respond – so perhaps I lied earlier when I said all of my wildest expectations have been achieved! Who doesn’t want their efforts rewarded with Wil Wheaton’s blessing on Twitter? That’s frame worthy! But I digress . . . The feedback I received to the analysis of combat speed was fantastic; it motivated me to continue writing. Without that early interaction with others in the online D&D community, my desire to create new content for the blog may have fizzled. However, it seemed that at least a few people were interested in what I had to say and I continued to write and write. During the past year, The Id DM has featured 80 posts comprised of 173,726 words including 11 interviews. I don’t know how to judge such numbers, but it certainly felt like a lot of work during the past year! It is always my attempt to bring a unique perspective to each column that I post. The columns have taken on several flavors with the most popular being my efforts to analyze 4th Edition. Outside of research and number crunching, I have also devoted space on the blog to looking at roleplaying games through my training as a psychologist. I find the personal and group dynamics between all players to be remarkably interesting, and I have attempted to highlight various psychological principles while discussing gaming issues. I’m A Bad DM. Now What? Transtheoretical Model: Are You Ready For D&D Next? Without any foresight on the matter, my blog has also featured an interview series, Ego Check, with various talented men and women in the roleplaying game community. I did not originally intend to conduct interviews for the blog, but it has worked out beautifully! I have enjoyed the luxury of communicating with motivated and creative people for in-depth interviews. I am thankful for all of the time they devoted to me during the interview process. If you happened to miss out on previous interviews, then you can find a list here. More recently, I have collaborated with illustrator Grant Gould and the fine folks at This is My Game on a monthly monster series, No Assembly Required. Each month I have designed a monster with complete background information to use in a 4th Edition campaign. Scheming with Grant Gould on the look of each monster has been super-duper fun, and I look forward to continuing the creative process. Monsters in the series so far are below. It’s been an amazing year for the blog, and I anticipate Year Two will bring its share of good things. I have several irons in the fire that I’m excited about – more research, more interviews, more monsters, more everything! In addition, it is my plan to attend GenCon for the first time and hopefully meet many of the great folks I’ve interacted with online during the past year. Speaking of which, I must once again thank everyone that has taken the time to visit the blog and read any of the articles. Thank you to those that have taken the time to write comments or send me an email. Thank you to the players in my campaigns for allowing me to discuss examples from our home games. Thank you to those that have spread the word about my blog through online forums, blogs, podcasts and tweets. It continues to amaze me how some people find my site, and it is rewarding to see individuals who work for Wizards of the Coast discussing something that I wrote. 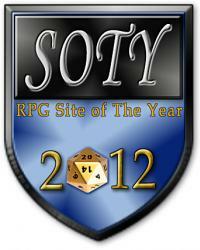 It has been an honor to contribute to the conversation about D&D and other roleplaying games. To close, I want to offer special thanks to Mike Shea of Sly Flourish. His inclusion of me on 4eBlogs (and now DnDBlogs) was a great boon to the visibility of my site. My research articles seem to strike a nerve with him and his eagerness to process and discuss the results has certainly added to the number of people who visit the site. If I’m ever able to quit my day job to write about D&D full-time – as he suggested to me in a podcast – then he can be my boss and tell me what to write about. You have my keyboard, good sir! I look forward to the continuation of my 4th Edition campaign and whatever lies ahead with D&D Next. Thank you to everyone for making the last 365 days pretty damn interesting! This entry was posted in Gratitude, Introduction and tagged D&D, Dungeon Master, Dungeons & Dragons, Gaming, Psychology, RPG. Bookmark the permalink. Happy birthday, Iddy! It’s been a good year indeed for the blog. You’ve got a great blog and a unique viewpoint on the game. Here’s to hoping you keep this blog going for years to come! Yes, it has certainly taken up much more time than I imagined. But I continue to enjoy it. Thank you for the feedback! What an incredible discovery. Excellent site! Here’s to another year of 4e content. Thank you! I will certainly continue discussing 4th Edition and probably a bit of D&D Next whenever it is released.